He’ll probably be confirmed, but the former senator didn’t exactly stand tall. Chuck Hagel may still be confirmed by the Senate as secretary of defense, because Democrats who hold the majority will probably vote with the president. But if the Israel Lobby manages to cull a few Democrats to join what appears to be a growing Republican tidal wave against Hagel, he’ll be shot down. Just as Chas Freeman—whose views are in roughly the same ballpark as Hagel’s—was shot down, even before his appointment got off the ground three years ago. But Hagel didn’t help himself with a confused, stumbling appearance yesterday in front of the Senate Foreign Relations Committee. Admittedly, the SFRC was infested with what seemed to rabid jackals, extreme-right Republicans like Ted Cruz of Texas and Lindsey Graham of South Carolina, along with John McCain of Arizona, still fighting the long-lost Iraq war. But Hagel, rather than take any of them on, shucked and jived his way through the ordeal. It was the Apology Tour, during which Hagel alternately apologized for having semi-progressive views on issues such as Israel and Iran or, otherwise, denied he had them. 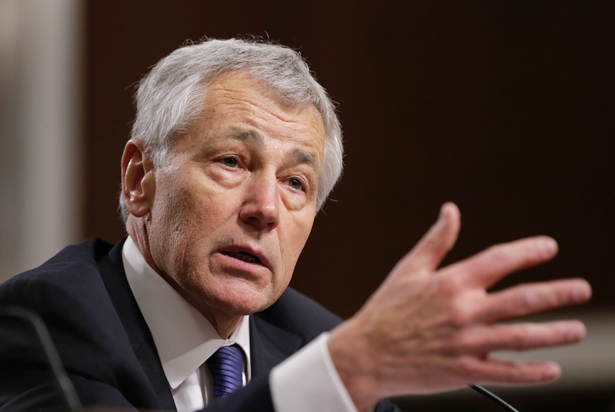 There was dismay from Democrats and derision from Republicans about Mr. Hagel’s sometimes stumbling performance during seven and a half hours of testimony. Former Nebraska Sen. Chuck Hagel was, at turns, halting, befuddled and, often, just plain bad during his confirmation hearing to be the next Secretary of Defense.… He appeared to be taken completely aback by the aggressiveness of the questioning from many of his former Republican colleagues on long-hashed over topics like his posture toward Iran and Israel as well as his past statements regarding the surge in Iraq. Several Democrats seem mostly interested in protecting themselves from being seen as too cozy with Hagel because of his previous statements about Israel, its issues and its lobby (e.g. Sen. Kirsten Gillibrand, D-N.Y.), and others seemed mostly concerned about pork (e.g. Sen. Richard Blumenthal, D-Conn.). Only moderate Joe Manchin (D-W.V.) seemed to be more worried about Hagel’s declining fate on the committee than feathering his own political nest. Particularly offensive was Senator John McCain’s (R-Ariz.) insistence that the witness pay homage to McCain’s dogma on the sanctity of the “surge” as rescuing America from ignominy in Iraq (which it did not). I am fully committed to the President’s goal of preventing Iran from obtaining a nuclear weapon, and—as I’ve said in the past—all options must be on the table to achieve that goal. My policy is one of prevention, and not one of containment—and the President has made clear that is the policy of our government. As Secretary of Defense, I will make sure the Department is prepared for any contingency. I will ensure our friend and ally Israel maintains its Qualitative Military Edge in the region and will continue to support systems like Iron Dome, which is today saving Israeli lives from terrorist rocket attacks. Hagel may indeed give good advice to President Obama, about avoiding an attack on Iran and about pushing Israel back into talks with the Palestinians. He may tell Obama that the defense budget needs to drop sharply. But it seems he’ll do it privately.